Early references to Fylingdales may be found in Charlton's History of Whitby describing the acquisition of part of Fylingdales from William the Conqueror by Tancred the Fleming who then sold it on after 30 years to the Abbot of Whitby. Then and in later years there are references to "Fielingam et aliam Fielingam", "Fieling and the other Fieling","Figeling", and "the town of Suthfieling". 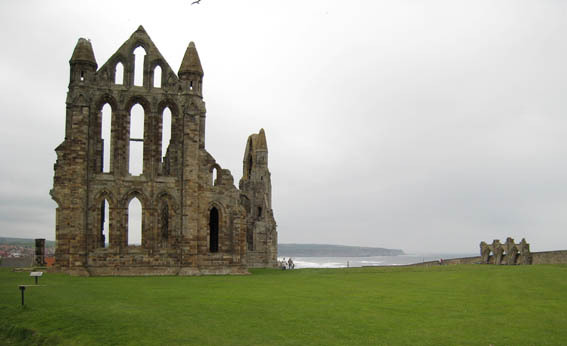 Then according to Young it was about the year 1107 when William de Percy, Abbot, founded St Stephen's chapel which is later included in the list of chapels belonging to St Mary's of Whitby in 1353. (c) Earl Hugh claims of Wiliam de Percy 1 carucate in Figelinge in the wapentake of Langeburgh saying 'it belongs to Witebi, but he has no proof'. To see a copy of the actual relevant extract from the Domesday Book itself click here. On a lighter note it should be said there have been attempts to link the famous Robin Hood to the Bay. Perhaps the most entertaining piece is the following extract from ROBIN HOOD's FISHING:(11). And there a fisher-man will be." June 19th 1332. In the 3rd year of the reign of King Edward John Storm was convicted of taking a hind calf in Overstyrigg within the forest of Pickering, and he was outlawed. John Storm of Levisham, bailee, had to find 13s 4d, and William Storm paid 5s because the said John did not appear. 1390 Charlton's preface reads - "As for the Allatsons, we find them located at Fyling-Dales , anno 1390; but I am of the opinion they possessed no freehold there, the whole parish belonging to the Monastery of Whitby."(9). 1539 At the Dissolution Richard Cholmley Esq., obtained a lease for 21 years of the site of the abbey and several portions of its lands. In 1550, before the expiration of the lease, these were sold by the Crown to John, Earl of Warwick, and the following year they were resold to Sir Edward Yorks, from whom they were purchased in 1555 by Richard Cholmley, who had, in the meantime. received the honour of a knighthood.(2). One of the properties is listed as Stoupe Brow with Willms. Cockerell as tenant. 1540 A survey of Whitby Abbey after the Dissolution has 'Robin Hoode Baye' with familiar names and a 'herynge house'. (4) Matthew Storm's name is prominent and there are 5 other Storms i.e. John, Peter, William, Robert and Bartholomew. 1553 In Whitby Abbey accounts "...pensions & ac still chargeable on the Abbey in 1553.......Johannis Storme xxvj s viij d (16). "....and several houses in Robynhoodebaye in the tenure of John Bircham...."
"....also twenty two cottages in Robynhoodebaye in the several possessions of....."
"....also a close in Robynhoodebaye called the Cow Close let to Matthew Storm for a yearly rent of 38s 4d..."
".....also a cottage and close called Langethwaite Close near Robynhoodebaye in the possession of George Hewitson.......... and a cottage at Langethwaite ... let to Robert Richardson ..... and another close at Langethwaite ..let to Peter Storm...."
"....also twenty eight cottages in Robynhoodesbaye let to..."
John Clemens, Richard Daysonne, Katherine-lately the wife of John Dixson, Robert Docheman, Richard Hart, William Hepler, William Hewetsonne, William Huntrowes, John Laycocke, Robert Lelone, John Malteby, Joanna-lately the wife of Christopher Malteby, John Morsonne, the wife of Robert Moresonne, William Richardsonne, Agnes Salmon, John Smythe of Wakefelde, William Smythe, Thomas Stanrigge, Bartholomew Storm, Peter Storme, Robert Storme, William Storme, Thomas Thomsonne, William Willson, William Wrenche, Robert Wyndell. "in FylingeFeilde" - John Huntrowes and Thomas Huntrowes, William Stanerige. "in Fylinge" - Edward Allatson, Richard Broune, Peter Dale, John Dobson, Joanna Fletcher, Robert Gretham, John Huntrowes. "in Thorpe" - including 15 cottages - Allotson, Beane, Becham, Colson, Dale, Doson, Floter, John Grenekell the Parson, Harland, Jenkinson, Mershingales, Manne, Pate, Poskett, Radstone, Salmon, Sheminge, Sneton, Thomsonne, Watson, Wilsonne, Wodehouse. 1573 Edward Sneton of Fylingthorpe willed that his wife should be followed in possession of his farm by his daughter,Isabel Storm. (1) Dr George Young's History of Whitby, vol 2, 1817 p297. (3) J Gardner & R Brodie, editors of Letters and Papers, Foreign and Domestic of the Age of Henry 8th, pt 1, 1894 p314. (4) Cartulaiun Abbatiae de Whiteby, Surtees Society LX11, 1905 p741-2 (PRO SC 6/4624, m6R, Ministers' Accounts. Henry 8th. (6) Calendar of Patent Rolls, Edward V1, 3, 1925 p372 and 4,1926 p34. (9) Charlton' History of Whitby (A list of subscribers includes Mr Matthew Storm). (11) Robin Hood's Fishing edited by Stephen Knight and Thomas H. Ohlgren c/o Rochester University originally published in Medieval Institute Publications 1997 by Kalamazoo, Michigan. (14) Article "Why Robin Hood's Bay" by Jack Binns in the Transactions of the Scarborough Archaeological and Historical Society Number 36 of the year 2000. Also copy of 1825 print of accounts porvided by Christiane Knoebel, Hon Librarian & Archivist of Whitby Lit & Phil. (15) Copy of document printed 1802, Auctoritate P Nicolai, provided by Christine Knoebel. (16) History of Abbies and Moasteries by Sir William Dugdale 1817. (18) John Burton's Ecclesiastical History of Yorkshire 1758 p163. .
(22) National Archives SC1/33, no 202. (23) Article by Johannes Keuning published 1950 in The International Journal of the History of Cartography.